Right, that's it from me. 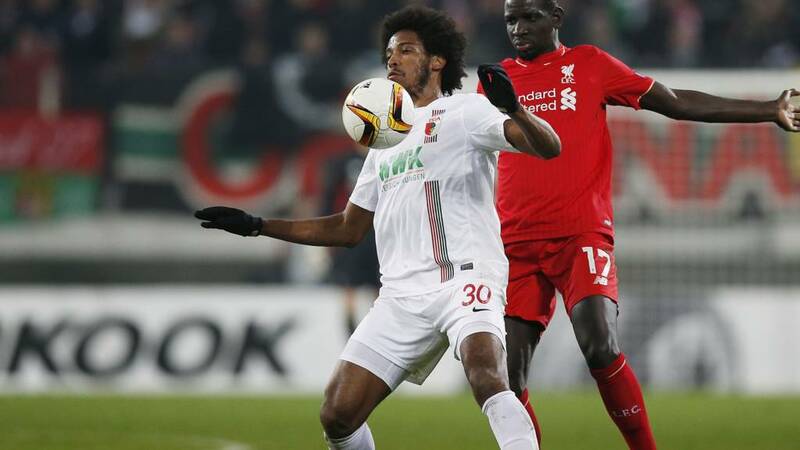 Liverpool have a whole week to gather their thoughts and take on Augsburg in the return leg at Anfield. That's four days before they face Manchester City in the Capital One Cup final the following Sunday. A week where Jurgen Klopp earns his corn. Full reaction to tonight's game will appear on the BBC Sport website later. Meanwhile in Spain, Gary Neville's Valencia whoop Rapid Vienna and surely book a spot in the last 16. I'm not sure but I think Neville might have smiled after that result. Could be worse Liverpool fans, you could follow Manchester United! Not a vintage night by any means but Liverpool will have a week to prepare for the return leg at Anfield, where they will fancy their chances. Emre Can tries to break clear but Markus Feulner is booked for brining him down. That's it, all over. Ragnar Klavan hoofs it down field, Kolo Toure heads clear but Augsburg will take a throw. Very much a rugby union play. Into stoppage time. Two minutes of it. Not sure we're going to get a goal here. Phillipe Coutino gathers a misplaced Augsburg pass, advances on goal, shapes to curl one into the top corner, but it's deflected behind for a corner. That comes to nothing. The Reds have not been good in that department tonight despite trying a few creatibe ones. Might that be the last chance? That scare for Liverpool might change their mindset. Time to stick with what they have? But Liverpool are on the attack. Down the other end and it's close to an opening goal for Augsburg. The ball is clipped to the back post, it's nodded back to Ji Dong-won who smashes a shot slow into the base of Simon Mignolet's right-hand post. Liverpool are mightily relieved. Journalists in the stadium are privately hoping this one remains 0-0 to avoid a hasty re-write. Jordan Ibe tests Marwin Hitz in the Augsburg goal but it's not too much bother. Good chance for Augsburg as they advance down the right side of the Liverpool penalty area, but the hosts make a right hash of it. Alexander Esswein is the guilty party. Would a draw suit Liverpool? Probably. But an away goal would be even better. Still time for one, should they want it. A slight improvement over the last 15 minutes but it's not been a vintage night in the Europa League. The final is Basle on 18 May looks a long way off. Ten minutes left. Ji Dong-won, formerly of Sunderland, replaces Tobias Werner for Augsburg. Jordan Ibe is on for Liverpool's James Milner. Divock Origi is lurking with intent as Marwin Hitz clears from his hands. Time for another change? Alberto Moreno is now booked after slicing down on Markus Feulner. From the free-kick, the ball is cleared and Dominik Kohr's long-range effort is stopped by Simon Mignolet. A better game now. Augsburg should score. A cross from the right is stabbed goalwards by Kostas Stafylidis and somehow Caiuby cannot poke it home from a few yards out.